Helen Grubb, left and Maria Bucio, FNP enjoying a beautiful afternoon. When Family Nurse Practitioner Maria Bucio “discovered” Housecall Providers, it was as though she had stumbled upon some unique model of delivering health care. Which, of course, she had. Now, as one of the more experienced practitioners, Bucio can draw upon her work with her patients to help others understand what it takes to provide the proper care to those with chronic disorders who often can’t tell you what hurts or how they’re feeling. But when she was hired five years ago, she herself needed that mentoring. That kind of jack-of-all-trades attitude was handed down to her from an uncle in Mexico. “He was a general surgeon in town but had a little office at the side of the house. Everyone came to him, and he had to do the best he could to help them,” she says. Her admiration of her uncle’s work developed early. to finish her bachelor’s work at Linfield College. She got a master’s degree at OHSU, and, with family living in the area, Oregon has become her second home. Her patients pose multiple challenges. They range in age from their 40s to 103. Conditions include autism, dementia, Alzheimer’s disease, heart disease, pulmonary conditions and cancer. “So many of them simply can’t express anything. I have to go by subtle signals and experience,” she says. At the end of the day, time is what the values most about Housecall Providers. It’s great to hear about Maria’s story. 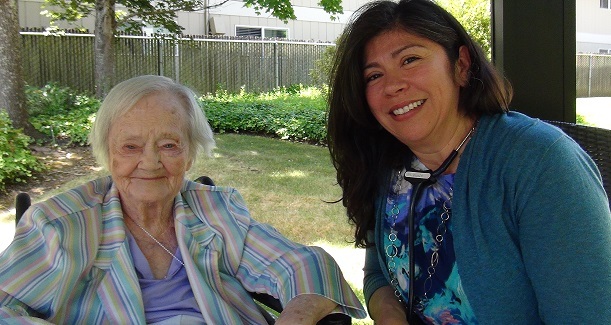 Without generous healthcare providers like her, things like hospice care which bring tons of comfort to patients and their families would never be possible.